ISBN Retrieval is the feature that ResourceMate® customers love the most. With it, you can get detailed and professional cataloging data in Z39.50 format from trusted sites, such as the Library of Congress, Archives of Canada and more (including Amazon)! All you need to do is type or scan in an ISBN number then click a button. Information that is found will be retrieved and can be edited or imported right into the library. Note: ISBN Retrieval requires your organization to register and have its technical support up-to-date. 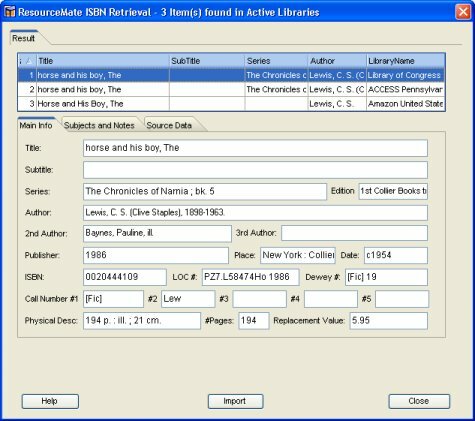 saves you time and keystrokes as you can avoid entering all the data for an item just by inputting an ISBN number and letting ResourceMate® do a quick search for you. You'll find ISBN Retrieval as a standard feature in al version of ResourceMate®. To search the various library sites, you will also need internet access on the computer that runs ResourceMate®. The basics of using ISBN Retrieval are really quite simple. Let's say we want to retrieve the cataloging data for a book titled, "The Horse and His Boy". In ResourceMate® we would go to File Menu and select Items (or we could just click on the Items button). Now in the Items Screen, we click on the New button at the bottom of the screen. We now get a blank cataloging record. At the top of the Main tab we see an ISBN field. The ISBN of this book is "0020444109", and we'll enter it in here. Once entered, we press Enter or click on the ISBN Retrieval button. We wait a few seconds as ISBN Retrieval does it's search, then it pops up this window with the information it has found. NOTE: Although ISBN Retrieval has a very high rate of success in finding information, there is no 100% guarantee that all your items will be available (ie. not every single book is cataloged at a Z39.50 source). We can now choose the source we would like to use, double check that the information is what we were looking for, or make any changes that you may want to make. Once it is to your liking, click Import. Your blank record is now filled in with the cataloging information. You can then add any additional information (ex. Purchased Price - there is no way any of our sites could know how much you actually paid for the item). Save the record and you're done with the item. 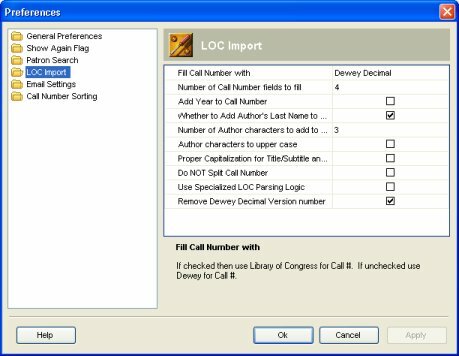 Preferences here include options on how to fill your call number fields and what to fill them with (ie. Dewey Decimal Number or LOC Number, and if you want to add in Author's Last name). 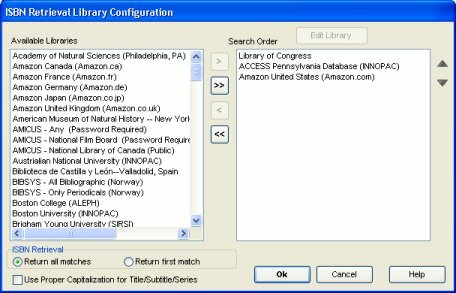 In this window you can select which libraries will be searched by ISBN Retrieval and in which order you would like the libraries searched. Adding more libraries can slightly increase your search time, but can greatly increase your chances of items being found. A few seconds to manage this screen will create an ideal search condition that you can use for every ISBN Retrieval you do with the option of easily customizing it per search if necessary.